Looking at the current population growth and to cope up with this increasing demand, there will be need to squeeze even more out of every acre of land, every drop of water, each and every available resource responsibly. Agriculture survey allows relief for the modern day farmer. Drone technology can cut down labour requirements and reduce resource requirements (such as fresh water and pesticides). While there are many ways to improve crop growth through the use of agricultural drones, there is also a question of its security aspect. Through the use of drones, farmers are able to monitor and record their crop. 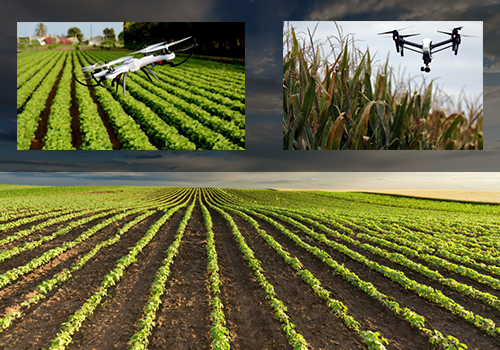 We are India based team of farmers, agronomists and drone operators developing and providing end-to-end drone solutions for agriculture. With a drone or UAV, highly accurate images can be captured of your fields, covering up to hundreds of hectares/acres in a single flight. Without the cost and hassle of manned services. At a far greater resolution than satellite imagery provides, even when there is cloud cover. Here e provide highly effective system and support for collecting, analyzing and exporting aerial data for precision agriculture and soon, application too. Thus Yolax drone-enable solutions are cost-effective, core tools in any precision agriculture program. Mine Planning - Effective mine planning is of paramount importance for the success of operations. Drone solutions offer visual information that ensure robust mine planning. We provide accurate deliverables with our long withstanding performance UAV. Our UAVs effectively collect accurate data from an entire open pit operation and generate client specific deliverables including progress monitoring, mapping data of an entire mining site and measurement of extraction volumes. With aerial LiDAR solution we can effectively customize the technology to provide the best outcome for any project. Mine Operation - Our drone solutions offer a smarter way to make mining operations more safe, economical and accountable. It is cheaper to operate than manned aircraft, which entail a number of running and maintenance costs. Drones and the powerful aerial data are bringing cost and time-saving innovations to a variety of mining processes. Drones in mining are the powerful provide aerial data and bringing cost and time-saving innovations to a variety of mining processes.